Wednesday June 23rd 1926 I worked on my rug all day. Fannie & Mary here for a short call. I was up at Mrs Moores in the evening. 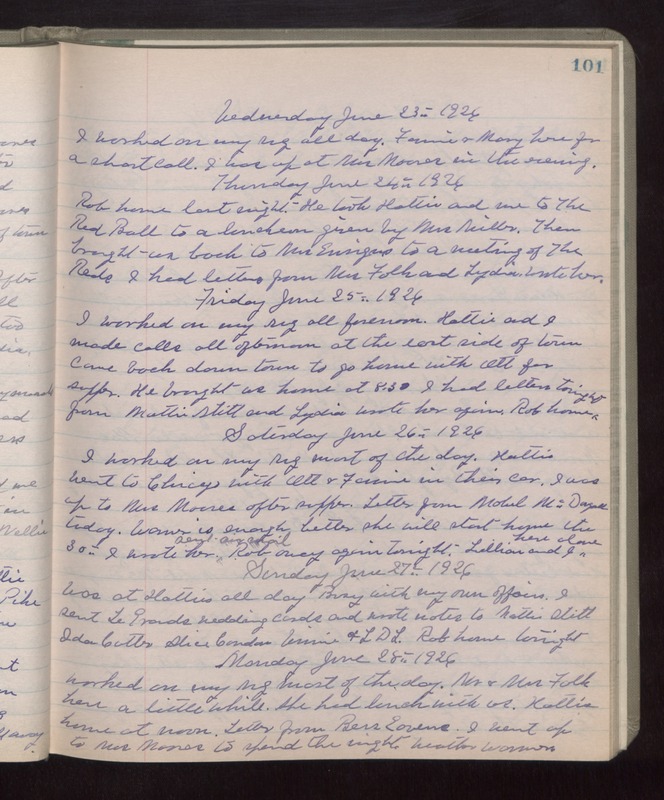 Thursday June 24th 1926 Rob home last night. He took Hattie and me to the Red Ball to a luncheon given by Mrs Miller. Then brought us back to Mrs Ensigns to a meeting of The Reds. I had letters from Mrs Falk and Lydia. Wrote her. Friday June 25th 1926 I worked on my rug all forenoon. Hattie and I made calls all afternoon at the east side of town. Came back down town to go home with Ott for supper. He brought us home at 8.30. I had letters from Mattie Stitt and Lydia. Wrote her again. Rob home tonight. Saturday June 26th 1926 I worked on my rug most of the day. Hattie went to Chicago with Ott & Fannie in their car. I was up to Mrs Moores after supper. Letter from Mabel McDougall today. Warner is enough better she will start home the 30th. I wrote her, sent air mail. Rob away again tonight. Lillian and I here alone. Sunday June 27th 1926 Was at Hatties all day. Busy with my own affairs. I sent LeGrands wedding cards and wrote notes to Mattie Stitt, Ida Cutter, Alice Condon, Winnie & L D L. Rob home tonight. Monday June 28th 1926 Worked on my rug most of the day. Mr & Mrs Falk here a little while. She had lunch with us. Hattie home at noon. Letter from Bess Eavens. I went up to Mrs Moores to spend the night. weather warmer.